With millions of families planning and looking forward to their next holiday or trip abroad, Etihad Airways has introduced a new range of ‘Etihad Explorers’ children’s activity packs and a Flying Nanny Kit, to keep its younger guests occupied while on-board. Etihad Explorers is the airline’s new children’s brand and will feature on activity packs and meal items, and aims to instil a sense of excitement and anticipation during their journey. 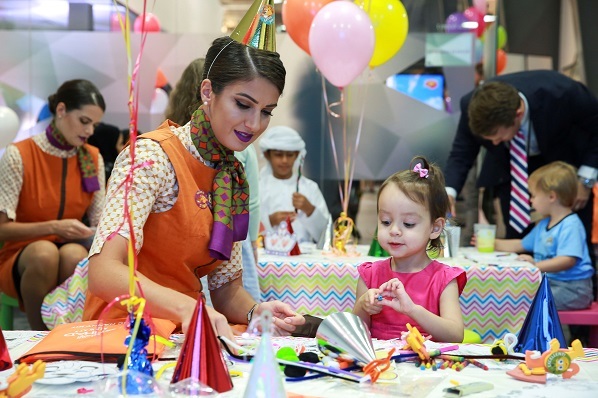 The new kits were launched at a colourful children’s tea party hosted by the airline at its state-of-the-art Innovation Training Academy in Abu Dhabi. On in-bound flights to Abu Dhabi, a new collectable character bag for three to eight year-olds contains an activity booklet, crayons, card games and a colour-in mask. The pack on flights from Abu Dhabi includes a unique suitcase board game which allows parents and children to play together, a foam lion character, colour-in postcards, crayons, and a handy waterproof travel wallet. Having a different pack on each leg ensures that children are kept well entertained on both journeys. For nine to 13 year olds there is a more mature activity pack which is guaranteed to puzzle and delight, containing Sudoku, mazes, lined notes and join-the-dot games. These packs also contain an Abu Dhabi themed pencil case, pencil, a dual-function bookmark and ruler, and a notepad. Tech savvy tots can also enjoy a range of films, television programs, games, and child-friendly albums and CDs through the dedicated ‘Just 4 Kids’ section on the Etihad Airways E-BOX inflight entertainment system, all of which can be enjoyed on the touchscreen and/or handset. For guests flying long-haul, every aircraft is staffed by a Flying Nanny. Trained by the UK’s world renowned Norland College, Flying Nannies were introduced by Etihad Airways in September 2013, and are on-board to provide an extra pair of hands and allow parents more personal time while they entertain the children. The new Flying Nanny Kit promotes greater interaction between nanny and child and contains an extensive range of fun items including Origami, games, pom-poms, flight certificates, tools for magic tricks and face-painting, and a ‘Flying Nanny stamp of approval’ which the nanny can use to reward children during their in-flight activities. Calum Laming, Etihad Airways vice president guest experience, said: “We understand that flying as a family can often prove daunting for parents and children alike, especially when travelling long-haul. “That’s why we’re continually looking for new ways to develop family-friendly products, like the new children’s activity packs, so everyone can be fully entertained from the moment they board. “This is just a part of our wider efforts to provide enhanced service and hospitality to our valued family fliers, an effort which is also brought to life by our amazing Flying Nannies. The new kits were created by Milk Jnr’s & Kidworks, a UK headquartered agency which specialises in creating engaging kids activity packs for some of the world’s biggest family brands, in partnership with Etihad Airways’ Flying Nannies and product development team.